This feature is only available if you have a Master Showroom with a Sub-Showroom. To learn more about creating a Sub-Showroom, see this article. For the following example, Brand A is the Master Showroom and Brand A (Mens), Brand A (Womens) are the Sub-Showrooms. 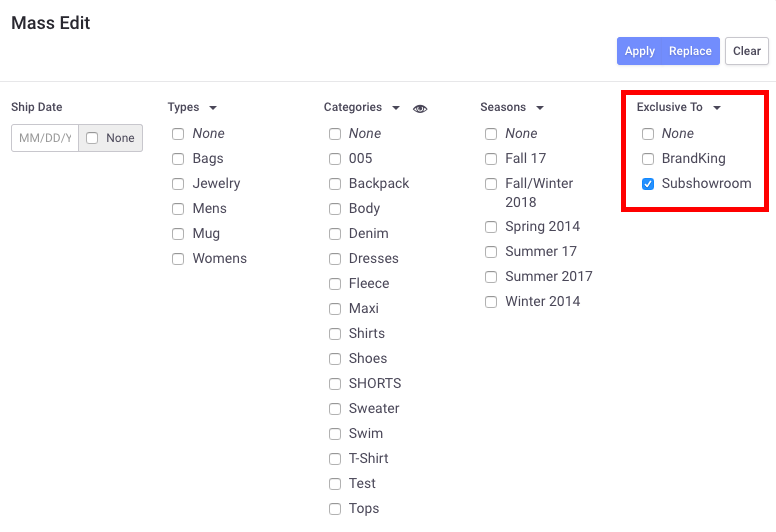 2) Check the boxes for the products you would like to make exclusive or click ALL icon to select all the products. By default, all products appear in the Master Showroom and the Sub-showroom. 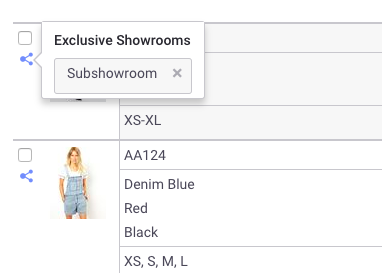 Select the Master Showroom only to hide products from the sub-showroom OR choose both the Master and Sub-Showroom(s) to make products appear in both Showrooms. In the example above, my products will appear in both Sub-Showrooms. underneath the check mark button in List View. Clicking on the icon will show you which Showroom the products are currently in.